A two thousand year old tradition was brought to Alaska by Russian missionaries, and into the interior by a man of Native American descent. They now consider it a native tradition — their own tradition, their own faith. Narrator: They trace their beginnings back 2,000 years to Pentecost, to the very beginning of Christianity. 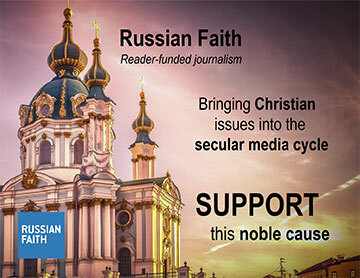 In honor of the missionaries who brought them the Faith, they take the name "Russian." Because they believe that they, alone, have kept the faith of Christ and his Twelve Apostles, they call themselves "Orthodox." His Grace Bishop Gregory: We consider the Orthodox Church to be the original Church that was founded by our Lord Jesus Christ, and, in the history of the world, it's almost a thousand years ago. And we consider Orthodox exactly what it means - to be true to the original. Fr. Joseph Kreta, Dean of St. Herman's Seminary: We also believe that the Church should not be changed because of the needs of the times. We feel that the Church can remain constant, can remain true to the faiths - to the TRUTHS that have been handed down for almost two thousand years and still be very applicable for every person in the world today. Narrator: They believe that God's Kingdom, which is to come, is also for the here and now, that there's a sacred dimension to all of creation. Through Christ, through the Scriptures, and through the Church, this world is redeemed as the Kingdom of God. Orthodoxy is filled with symbolism. Everything is significant. They sing the Thrice-Holy Hymn: Holy God, Holy Mighty, Holy Immortal, have mercy on us. Their prayer is to the Holy Trinity: Father, Son, and Holy Spirit, the most important Three of the Orthodox faith. But there are other distinctive threes. The distinctive three-bar Cross used widely in the Russian Church: The top bar represents the sign above Christ's head which said, "This is Jesus, the King of the Jews." The middle bar is for the cross where Jesus' hands were nailed. The bottom bar is slanted to show Christ's physical suffering, portraying agony so intense that He wrenched loose the nailed cross-bar as He pushed one foot down and drew the other up in pain. For the Orthodox, there are three embodiments of God: The world, all of creation; the written Word of God, the sacred Scriptures; and Jesus Christ, God Who became man. 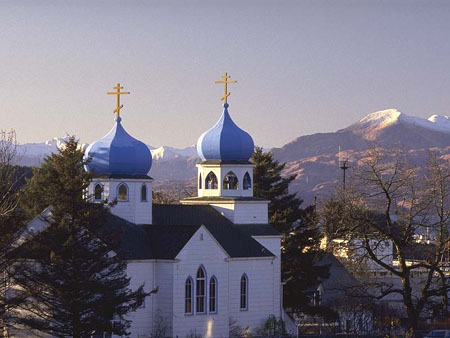 Orthodox Church buildings are designed with three sections, representing the three Incarnations. The narthex, the entry hall, represents creation. The nave, the largest area of the building, represents Scripture. The icons here depict events from the Bible and scenes from Christ's life and the lives of the saints. Behind the iconostasis, the icon screen, is the sanctuary, representing the Kingdom which is to come, the dwelling place of Christ. The ordained clergy enter the sanctuary and bring out the elements of the sacraments to the people. The Kingdom which is to come is brought into the here and now. The building is topped with a dome. Rather than a steeple reaching up toward heaven, to another world, the dome above the nave shows God's Kingdom come to this world, restoring it, reclaiming it as God's. In 1054, there was a split between the Church of the West and the Church of the East. The Western Church pledged their allegiance to the Bishop of Rome, the Pope. The Eastern Church was centered in Constantinople but looked to no one Bishop as the highest authority over the Church. The Western Church worshiped in one language: Latin. The Eastern Church worshiped in the language of the local people. When the first Orthodox missionaries came to Alaska in 1794, they brought this tradition with them. In the Aleutians, they worshiped in Aleut; in Southeast, Tlingit; in southwestern Alaska, Yupik. The people accepted the faith as their own and, in turn, passed it on to others. When Fr. John Veniaminov arrived in Unalaska as a missionary in 1824, he found that the faith had already been started among the people. In addition to making converts, he put his energy into further educating the people already in the faith. He created an Aleut alphabet, made translations, and taught the people in their own language. Veniaminov later became Bishop Innocent of the new Diocese of Kamchatka, the Kuril, and Aleutian Islands. He went on to become Metropolitan of Moscow, and in 1979 was canonized as a saint. The early missionaries also defended the native people against the abuses of the Russian traders. Fr. Michael Oleska, University of Alaska-Fairbanks: The first mission to Alaska arrived officially in September of 1794. By that time, the situation was that the Russian-American Company or its ancestor, the Sholikhov-Golikov Company, had pretty much established its monopoly on the island and were abusing the labor force, namely the local Supgiaq or Alutiiq Aleut people. The clergy recognized that this was not going to be conducive to the acceptance of their preaching. Fr. Joseph Kreta: They immediately told what was wrong with the way the Russians were acting and the way that the Russian fur traders were behaving and defended the native people. And with this defense of the native people, the people turned to them and trusted them. And in addition to this, the missionaries had a very strict training or advice and guidance that was so beautiful. The missionaries were told, "When you come to America, when you come to Alaska, you are to consider yourself a guest in someone's home, and you will act accordingly." Fr. Michael Oleska: It has become, since Veniaminov's time, certainly, in 1824, an Alaskan native native religion rather than superficially a white man's religion with white clergy with missionaries continuing to run the Church after the initial introduction of Christianity had taken place. Bp. Gregory: When I came to Alaska, which was almost thirty years ago, there were 84 villages - and parishes we called them - and only ten priests. Ten priests that were old, six of them already passed away. So you can imagine this great land, with 84 villages, with ten priests. It was simply impossible to take care of! Fr. Joseph Kreta: We felt that the greatest need was to train an indigenous clergy, to train the native people in Alaska for the Church in Alaska. Narrator: Along with the Church of the Holy Resurrection, St. Herman's Seminary is situated on a hillside overlooking the wharves and fishing boats of Kodiak. Students come here from Orthodox communities throughout Alaska to prepare for service in their Church. The seminary is named for Fr. Herman, a monk who was among the first group of missionaries to arrive here from Russia in 1794. He founded a school and an orphanage on nearby Spruce Island. Today, the seminary students are making a pilgrimage to Spruce Island to honor St. Herman. The island lies just north of the city of Kodiak. They must anchor close to shore and paddle in in a small boat. Many days, high, wind-blown waves break against the beach in Monk's Lagoon, preventing access. Today, the water is calm. They say that St. Herman is watching over them. >> We believe that, since the canonization of St. Herman in 1970, that there has been a spiritual renewal in many ways in the Church in Alaska, and, indeed, in the United States because St. Herman doesn't belong to Alaska; he belongs to the Orthodox faithful throughout not only the United States, but throughout the world, and not only for this generation, but for all generations to come. Fr. Joseph Kreta: And, as we go up the path, you'll find the chapel of St. Sergius and St. Herman of Valaam. This is built over the grave of St. Herman. When St. Herman first came to Spruce Island, he dug a cave, dug a hole, and he spent his first winter in that cave in the side of the hill. And he stated later that when he died, he wanted to be buried there. Narrator: In 1970, Fr. Herman became the first Orthodox American saint, canonized by the Church as Saint Herman of Alaska, Wonderworker of all America. It's said his life was a perfect example of holiness, that he performed miracles of healing and prophecy. Since his death, there have been accounts of miraculous healings from people who have come to Spruce Island to pray and anoint themselves with earth from his grave and water from a nearby spring. His relics have been removed from the grave on Spruce Island and are now in the Church of the Holy Resurrection in Kodiak. Fr. Joseph Kreta: Our students come from completely different backgrounds. Some of them come from the Yukon River. Some come from the Kuskokwim. Some of them have been from the Aleutian Chain, the Pribilof Islands. Some are very young. Some are married. Some have families. The first graduate of our seminary was a Tlingit Indian from Sitka who had 14 children at the time that he enrolled in the seminary. I think the oldest student that ever enrolled in the seminary was 68 years old at the time that he enrolled, and, of course, the youngest would be those that have just graduated from high school, since the high school diploma is a prerequisite for entrance to the seminary. Teacher: It's very important what he says right after that: I and the Father are one. But really, what's really . . .
Fr. Joseph Kreta: We hope that the graduates of the seminary here would be priests in the Alaskan Diocese. And because of that, most of our training and our courses are geared at the spiritual life here in Alaska. But, at the same time, we have tried to follow the old tradition that goes back to the early missionaries, and that is to train people for life in the villages and to become leaders in their communities as well. And it's because of that that we have women in the seminary. Recognizing that life in the Alaskan villages is not what it is in many of the other communities, we have a course in health, and we've found that some of our students have gone back and have been helpful in saving the lives of people that were hurt in boating accidents and had given CPR and so forth. Our graduates now will have level one certification as alcoholics counselors. Others have gone back and helped as teacher's aids. But we try to train them in a way that they can be helpful and good parts of their community and help guide the life of their community. Simon Chunak: I'm going on my fourth year, and hopefully, I might be graduated from St. Herman's Seminary. And then, hopefully, I might go out and teach my people what I have learned in here, in St. Herman's Seminary. Angeline Anderson: In our rural areas, there's a great need for trained church readers. I am here for that purpose. I hope to help my church, my people. Hieromonk Gerasim: My first motive was I wanted to put something back into a country that had been very good to me. And my church was a natural avenue for that. And the more I found out about the situation of the Church up here, the more that became apparent to be a good place. Narrator: Fr. Gerasim is a recent graduate of the seminary. He will now be the priest for nine communities on the Alaskan peninsula, nurturing them in a faith that is 2,000 years old, a faith that came to Russia 1,000 years ago and has been in Alaska for nearly 200 years. [Choir singing the Akathis to St. Herman] . . . O Chosen Doer of Wonders, most glorious favorite of Christ, our God bearing Father Herman, Alaska's adornment, the joy of all Orthodox in America. We sing to you, our heavenly protector and powerful intercessor before God, these songs of praise. Cease not to pray for your children, who cry fervently to you: Rejoice our blessed Father Herman of Alaska, America's most glorious doer of wonders. The Creator of the Angelic Hosts, called you, Father Herman, to proclaim the Orthodox faith in the new land and to be the founder of the monastic way in the remote lands of the North. You were sent, as was the Apostle Paul, to those sitting in darkness so that the light of Orthodoxy might brightly shine to all the ends of the world. We, the inhabitants of the American continents, bring you this thanksgiving and sing this song of praise . . .
Fr. Joseph Kreta: We try to serve in this northern vineyard of Christ, and hopefully there will be fruitfulness. But the fruitfulness is something we'll never know in this lifetime. Fruitfulness can never be gaged by the start of a seminary, by the rebuilding of a cathedral, by the construction of new churches. Success will be gaged at the Last Judgment. And until that time, we just try to follow, very simply, the teachings of Christ to His Holy Church and the Scriptures, of course, because the Orthodox Church is a Scriptural church. And, basically, one of the teachings of St. Herman who taught that, from this day forth, from this hour, from this minute, let us learn to love God above all else. If we can do that, there's nothing but good things in the future. Rejoice, most glorious savior from a forest fire . . .
Narrator: Russian Mission sits on a hillside above the Yukon River, where it flows out onto the flat Yupik-Kuskokwim Delta. About 175 Yupik Eskimos live in this isolated village, making their living mostly by hunting and fishing. No roads come here. All supplies must be flown in, or else shipped in by barge in the summer, when the river is free of ice. Their way of life is simple and traditional. Most of the villagers are Russian Orthodox. It is Holy Week, the week before Easter. The faithful gather for services every day this week, preparing for Easter Sunday, the most important day of the Orthodox year. They carry on the tradition brought here by the early missionaries. In the early 1800's, the Russian American Company ventured up the Yukon and Kuskokwim Rivers and set up small trading posts The Church followed, establishing a vast interior mission parish that covered thousands of square miles. Ordained clergy were in short supply, and one priest, Father Yakov Nestvetov, of Aleut descent, was sent to serve the entire region. In 1845, he established the parish headquarters in Ikogmiute ,which is now called Russian Mission. The Russian American Company's trading post had been abandoned, and the mission was established without Company assistance and maintained solely by Church funds. At 11:30 Saturday night, the people gather for the Easter service. Fr. Gabrielov, priest for Russian Mission and the Yukon Region, is already vested in his brightest robes as he completes the preparation for Pascha, the passover from death to life. On Good Friday, a replica tomb was placed in the center of the church, and the holy shroud, an icon of the crucified Christ, was placed on top of it. Now, Fr. Gabrielov takes the holy shroud into the sanctuary and places it on the altar. The people take candles and walk around the outside of the church, symbolizing the journey made by Mary Magdalene, Mary Cleophus, and Salome to Christ's Tomb in the early morning. Easter in Alaska is not always warm, as it typically is elsewhere. Although it is April, it's below zero and the path is covered with packed snow and ice. After three times around the church, they stop at the door and wait, as if waiting outside Christ's Tomb. They continue to sing, repeating each verse in three languages: Yupik, their native tongue; Slavonic, in honor of the missionaries who brought the faith; and the newest language of the community, English. They sing, "Christ is risen from the dead trampling down death by death and upon those in the tombs bestowing life." Then the doors are reopened, and the people reenter the church. While they were waiting, the dark colored cloths inside were replaced with bright white. It's midnight, Easter morning, the beginning of the holiest, most joyful holiday of the Orthodox Church. In less isolated communities, fresh flowers fill the church at Easter. In Russian Mission, where there are no fresh flowers to be had, they decorate with plastic flowers, tinsel, colored lights, whatever is bright and festive. The service goes on into the night. Fr. Gabrielov censes the altar, the icons, and the people that their prayers will rise to heaven, just as the smoke rises, and that they will be enveloped by the Holy Spirit, just as the incense envelopes them. There is the traditional Easter greeting. In other churches, this is the time when people turn to those beside them and say, "Christ is Risen!" to which comes the reply, "Indeed, He is Risen!" Here in the village, it's not the person on either side who is greeted; everyone in the church greets everyone else. They go to Fr. Gabrielov and venerate the Cross then greet each other with kisses on the cheeks. The whole community is united in this joyful celebration. There are always candles burning in Orthodox worship. They symbolize that God illuminates the world with His spiritual light. The service builds to the most sacred moment of this most sacred day of the Orthodox year: the consecration of the elements of communion. One at a time, the people approach Fr. Gabrielov with crossed arms to receive the sanctified bread and wine said to be the Body and Blood of Christ. This is the food of spiritual immortality and brings them into the realm of God's grace, into God's Kingdom here on earth. In most communities, the Easter service takes over two hours. In Russian Mission, it takes all night. They worship from 11:30 til dawn, keeping a tradition which has been passed down for 2,000 years, a tradition that was brought to Alaska by Russian missionaries and into the interior by a man of Aleut descent. They keep alive a native tradition, their own tradition, their own faith. Hieromonk Gerasim: When the Russians left, the Americans came. All of the various things that happened through this period of history, the Church remained the same. The Church was that identifiable cultural entity that was unchanged, and they hung onto it. And they still hang onto it today.